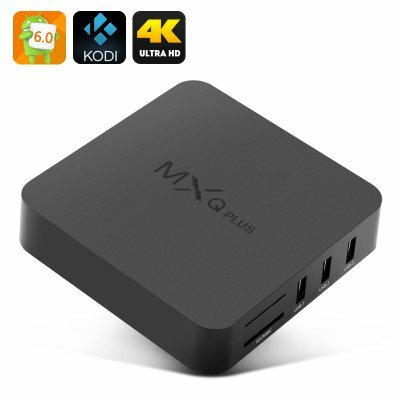 Successfully Added MXQ Plus 6.0 TV Box - Android 6.0, Amlogic S905 CPU, Kodi 15.2, 4Kx2K, HDMI 2.0, 4 USB Ports, SPDIF to your Shopping Cart. The MXQ Plus 6.0 Android Marshmallow TV Box features a powerful Amlogic S905 quad core CPU and with its future proof 4K support and output you're getting the best visual entertainment around. This attractive little TV box has a mighty 4 USB ports so you no longer need a separate USB hub to connect all your peripherals and storage devices. on top of that you get Wi-Fi and Bluetooth connectivity as well as support for Micracast, Airplay and DLNA so sharing media from your phone, tablet PC or laptop could hardly be easier. Of course, the noticeable difference between this TV box and its predecessors is that it runs on the new Android Marshmallow (6.0) operating system. Not only does this offer a reliable proficient interface but it comes with some nice additions and tweaks that greatly improve your users experience. With the Kodi 15.2 Media player coming preinstalled you can hop online and enjoy access to a almost limitless range of media, and all this ir ready to go right out of the box. A modest 8GB or memory is available but that shouldn't be of any concern thanks to the plentiful 32GB SD card support and USB memory options available. If audio output is as important as visual to you then you'll be pleased to find the audio output on this TV box, allowing you to hook it up to your speakers for great quality sound. to go alongside you 4K images. The MXQ Plus 6.0 Android TV Box comes with a 12 months warranty, brought to you by the leader in electronic devices as well as wholesale Android TV boxes..